Arizona receives plenty of sunshine during its winter months. With this mild climate comes a variety of colorful flowers that brighten the Arizona landscape. Trees, shrubs and succulent plants all provide flowers in winter. The sweet acacia is an evergreen tree with small thorns and medium green, fine foliage. The sweet acacia (Acacia farnesiana) has yellow flowers that resemble small puffballs. These flowers bloom from late winter to spring and give off a sweet fragrance. At maturity, the plant will reach between 15 to 25 feet tall. The cascalote (Caesalpinia cacalaco) is a tree with dramatic yellow flower spikes that bloom from winter to spring. At maturity, it grows to about 15 feet high with an equal limb span. The evergreen tree has dark green foliage and medium sized thorns. Seedpods develop after the flower bloom. 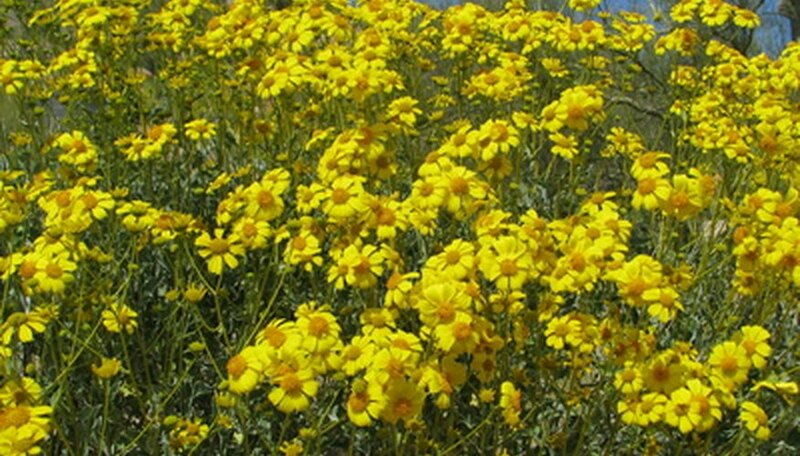 From winter to spring, the brittlebush displays an abundant amount of small yellow flowers that look like daisies. The brittlebush (Encelia farinose) grows wild in many parts of the Arizona desert. Both the flower’s center and petals are yellow, and grow on long stems that extend beyond the plant’s silvery-gray foliage. Shaped like a mound, the shrub has no thorns and needs little water. The bush dalea (Dalea pulchra) is a shrub with purple flower clusters that bloom from winter to spring. The flowers attract butterflies to this evergreen plant, which has silver-green, fine-textured foliage. At maturity, the bush will reach about 4 feet high by 5 feet wide. A native to Australia, the red eremophila, is grown in Arizona. It enjoys full sunshine and blooms from late winter to spring. The red eremophila (Eremophila maculata v. brevifolia) has red tube-shaped blossoms that attract hummingbirds and other birds to the bush. Its foliage is dark green and free of thorns, and at maturity, the plant grows to about 4 feet high and 5 feet wide. The twin-flowered agave (Agave geminiflora) is a succulent with yellow flowers that bloom during the winter. The slender, spike-like leaves are coarse and dark green. The rounded shaped plant doesn’t have thorns, but the tips of the leaves are sharp. The twin-flowered agave requires very little water. Hummingbirds are attracted to the flower blossoms of the Dawe’s Aloe. Dawe’s aloe (Aloe dawei) is a succulent with dark red flower spikes that bloom during the winter. While its reddish-green foliage is coarse in texture, the tips of its stems are soft and the plant has no thorns. At maturity, this succulent will grow to about 2 feet high by 3 feet wide, and needs little water.